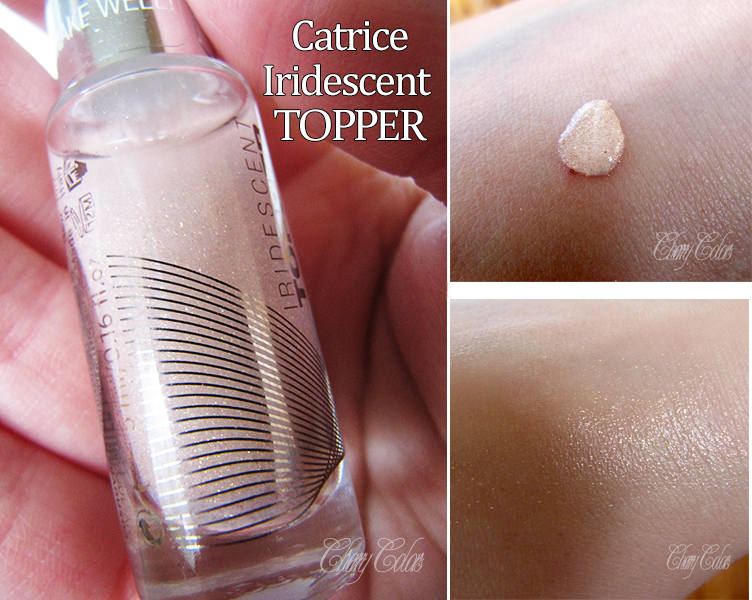 Review: Catrice Iridescent TOPPER ( iROSEdescent) - Cherry Colors - Cosmetics Heaven! Top of the Galaxy. This topper stands for one of the biggest trends in 2014: 3D-shimmer effects. The quick-drying liquid in a soft rosé-gold is applied on top of your eyeshadow or used as a highlighter for your body and face to intensify any styling. Glam-factor included! This is the product that the whole blogging world is raving about. Incredible, huh? It is quite an unique item - mineral eyeshadow mixed with a solution. You have to shake it for it to get mixed properly and then you can use it. It has a small pipete - one drop is more than enough for both eyelids. I thought it would dry sooner (because that's what everyone said), but it takes a good half minute to 45sec to dry completely. I mean alright, it is not that much but I was thinking more like three seconds :P.
It stays on my lids for the whole day (even without a primer) and I have oily lids. So this little bottle has some damn strong staying power! I tried using it on my cheeks and ahem, it was a disco ball kind of look - not for me, not right now. But I had to use my make up remover to get the damn thing off. Again crazy staying power. This is well worth the rave. It looks amazing and it stays on for the whole day. It takes some precision for a good application, but it is worth it. It an unique item in the beauty world (I think you could DIY something similar with some visine drops and a bit of mineral eyeshadow? ), which is always a plus.